This guest post was written by Robert Wringham, the editor of New Escapologist magazine. New Escapologist is a periodical of funny and practical essays with a focus on springing people from demeaning day jobs. About a year ago, I quit my job in a government office and left my home in Glasgow. Today I live in Montreal, where my girlfriend and I spend our time writing, cooking, eating, and watching fireworks at the quayside. I like to tell people that I’ve retired, if only to enjoy their reaction to such a petulant claim from a twenty-seven year old. Alas, this isn’t strictly true. I have enough financial reserves to keep me out of trouble for a few years but not yet enough to last until the typical age of retirement. One thing’s for sure though: I’m not going back to work in an office somewhere. No more clock-watching. No more mindless submission. Never forget the things from which you’re escaping. I got to the modest circumstances in which I now live by embracing a minimalist mindset, general frugality, sensible money management, a little geo-arbitrage, small entrepreneurial projects and banishing bad faith. I don’t own much. When I read that public-eye minimalist Leo Barbauta owns fewer than fifty things and that his caché of fifty things doesn’t include furniture, I was very surprised. I don’t even own twenty things. And why wouldn’t he include furniture in his list? To me, the main point of minimalism is to jettison liabilities and to maximise mobility: I wouldn’t have been able to stand up one day and move to another country if I had a house full of furniture and computers. One day I’d like to own nothing but two outfits and a laptop, but for now my glut of twenty things will suffice. More thoughts on minimalism here. To be frugal seems to be my default mindset. Why buy books when they’re provided for free in the library? Why buy cheap (read ‘disposable’) clothes when a couple of well-tailored suits will last forever? Why buy convenience food when it’s a simple and enjoyable exercise to make your own lentil dal or burger patties? Why sit indoors with an expensive cable TV package when reading in the local park is both free and mentally stimulating? Plugging those unnecessary outgoings is as important as earning money. I’ve got my personal monthly outgoings down to approximately C$450 and I don’t think I want for anything. According to my parents, ‘home economics’ was once taught in British high schools and part of this subject was to convey basic book-keeping. Today, ‘home economics’ has morphed into a weird combination of cookery and woodwork, both of which are underfunded and barely supported by the curriculum. Principles such as ‘your income must be greater than your outgoings’ and ‘cost is a ratio’ are no longer taught, yet it’s vital to know these things. I got lucky in that I was seemingly born with a logical way of looking at things, and my parents were always good at showing me the ins-and-outs of at least middle-class financial knowhow. If you don’t have these things in your favour though, it is still possible and important to self-educate. Geo-Arbitrage, loosely, is when you generate income in a country with a high-value currency and spend it somewhere with a low-value currency. To the business tycoon, this might mean purchasing goods in China to sell in America or setting up an Indian call centre to serve clients in England. My experience in geo-arbitrage was far more modest: I simply generated money in Scotland (through work) and moved to Canada, where British money goes a little further than the Canadian dollar. The C$450 I spend from savings per month took me only a week to earn in Scotland. I’d advise anyone to do the same thing: work somewhere lucrative for a while and relocate to somewhere vibrant and cheap, while maintaining a minimalist and frugal lifestyle. It is amazing how a couple of small projects capable of generating extra income can help. It is possible to boost those financial reserves before you even get around to serious investment regimes, making what you already have last a little longer. Such a project may be ‘passive income’ or a ‘muse’ or it might be a project done for love (such as self-publishing a book or speaking at events) but which makes a little money as a byproduct. These all help to top up your net worth and make the wealth pool last a little longer. One of the most important steps in plotting an escape is to realise that actions beyond the conventional are possible. It’s possible to get up and go if you want to. You can leave office drudgery or a bad town at the drop of a decision: there is nothing physically keeping you there. ‘Bad Faith’ is when you convince yourself that suffering is inevitable ‘because it’s just what people do’ but this is not the case. Banish bad faith and know that a better life is possible. Exercise the free will with which you were born. It is a gift. 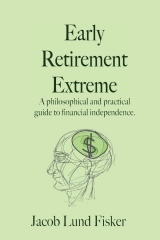 Now that I have significant financial reserves and a decent amount of ‘thinking time’ (one of the worst things about having a day job is that it’s difficult to plot your escape: you’re too busy working, preparing to work, commuting to or from work, or recovering from work), I can work on improving my financial education. My new personal goal is to use my new found time to get the financial reserves working for me. Maybe you’d like to do the same. Perhaps one day, my system of asceticism and refusal to submit to drudgery will prove hubristic and will blow up in my face like a comedy cigar. If that happens, I’ll have to go back to the day job, tail between my legs. But even in these unlikely circumstances, against which I have taken precautions, I will at least have enjoyed some (fit, healthy, youthful) years of freedom and will have something interesting with which to regale my colleagues at the water cooler. next post: Do I have to live in an RV to retire extremely early? 36 users responded in " No more mindless submission "
I know that sounds boring to a lot of people, but it sounds lovely to me. I get it. Plus the reading library books in the park part. That was well written and fun to read. Thank you for sharing. Further, I’m glad you find Montreal vibrant and cheap. Calgary, where I live, does not have the advantage of being vibrant; Hong Kong, where I plan to move when I am closer to financial independence, is not cheap. But I suspect one could find a way to live as you described in almost any city. It’s a big step to go for it like that. You have reserves, but not sufficient to keep living like that forever. It’s true that you get a lot more free time to start ‘thinking’ about ways to improve your financial situation, but wouldn’t it be safer to spend more time working first? Or at least work part-time until you are completely safe? Off course, I can understand that you would rather do it like this, and if it’s just a matter of personal choice to do it like this, then I salute you for trying and I hope you succeed. But I wouldn’t feel comfortable yet, in your situation. Nicely written. Congratulations and continued good luck! 27? Sweet. And thus the funds that will tie you over for awhile will allow you to properly entreprenuer a business that fits your needs. I really enjoyed the thought of Geo-Arbitrage. I keep telling my mother she should think about that for retirement. Hear about lots of people doing it. C$450! Way to go! Would you mind posting your budget? Why are you judging his count of things that he owns? 1) He has 6 kids and a wife and 2) Minimalism =/= lessism. I would like to read something about minimalism vs. frugality. It occurred to me, when I was trying to do list of stuff I own, that I have lots of bicycle tools (most of tools for first level in Zinn’s book). Without them, I would be forced to pay for repairs; without bike I would have to pay for transport (I can’t go everywhere on foot). My conclusion is, that some people are trying being too extreme when it comes to being minimalist, and I think it can be counterproductive in terms of being financial independent. Being moderate minimalist could be useful, but if someone goal isn’t mobility then I think is better not to use 110% minimalist approach. What an Inspirational piece! Look forward to reading your mag. From the family front on minimalism and frugality…we have given our kids plenty of things over the years that have ended up broken, donated but rarely played with. We now live in a great area with great parks and libraries and I am hoping to get rid of the ‘toys’ and instead play outside and read, eat, and sleep when we are home. Group one, the settled ones) They exclude certain common household items like furniture, dinner plates, stoves, … (some will also count their CD collection as 1 item). Group two, the backpackers) They are essentially traveling (usually through Thailand for some weird reason) with a carry-on and a laptop eating their food at restaurants and sleeping in motels. What both groups have in common is that they make their money blogging on a computer. Their main form of exercise uniformly seem to be jogging. This goes strictly for the "I'm proud of my list" minimalists. Personally I think striving for some kind of absolute minimalism (I only own 1 thing! 1) loin cloth) is silly. To me, minimalism is about owning the minimum amount of stuff to accomplish a task but otherwise not restricting myself. No way I'm going to take up jogging just to fit under some set number of items I own. That was a fun post..thank you. To continue this I suggest you keep one concept in mind….birth control. Wow, Jacob is a spendthrift hoarder compared to this guy! I like the idea that you don’t need to have enough saved to last the rest of your life. Congrats to Robert for making the leap. I love that you only own 20 things – I realize it’s a bit trendy (at least in the U.S., where everyone focuses on what everyone else is doing), but I don’t care about trends, and even when I was younger I would dream about the magic of owning only one object that could do everything for you, so that you would only need one thing. @sajo: I agree, being too minimalist can be counterproductive. A good set of tools would be more beneficial to have, even if it means you’ll end up with more stuff in general. With those tools you can build other items you need and when you don’t need them anymore, you can get rid of them. Need them again? You can remake them with your tools. I learnt some useful origami here. Especially the “masu box”. Now if I need a box to put e.g. some candy in, I’ll fold one… xD Candy eaten? I’ll just get rid of the paper. I like the idea of geo-arbitrage. @Robert, I was considering HK for retirement as well and have found so long as you drift further out from Central the prices drop pretty dramatically. Mui Wo and Pui Wo are fairly reasonable, by HK standards anyway. Food, healthcare and transport are surprisingly affordable and so long as you can knock out the housing costs I think HK is feasible. I’m looking into Malaysia as well – even cheaper still. I absolutely love this article, I liked the part on earning money in a high paying area and then moving to low cost area, great tip. Excellent post… I have gone through some of those steps… Although the recent economy crash has hurt my earning somewhere else and spending where it’s worth more (I earn USD and live in Canada). I haven’t yet taken the plunge of minimalism although I’ve been meaning to take the time to write down at least all my belongings and decide what I would and wouldn’t keep. Happy to oblige. My personal rent is 350$ (the total rent for our apartment is 700$ but by cohabiting girlfriend pays the other half). In Montreal, heating and electricity usually comes with the rent. Our unusual building also provides the Internet connection and basic cable (which I don’t actually use) and I do not have a cell phone. That’s a lot of utilities for which I do not have to pay. The remaining 100$ is exclusively for food. I shop at markets and sometimes the IGA, and prepare almost everything at home. The last big expense I eliminated was 70$ per month for public transit. Because I no longer work, I have time and inclination to walk almost anywhere. The longest walk I ever have to do is 2.5 hours but the typical walk is about 30 mins. The cost of shoe leather is negligible! 450$ is my ‘fixed cost’ so I will sometimes spend extra on a new suit or a flight to another country. If I do this, I set about generating the money first. That’s the spirit! I’d recommend taking “The Idle Parent” by Tom Hodgkinson from the library sometime. I think you’ll enjoy it. Public libraries can get pretty much anything for you. If you can’t find what you want on the shelf, ask if they’d consider stocking it for you or if you could get it as an Interlibrary Loan. @Rob – How do you clean the suits? Dry cleaning or some kind of gentle soaking? I rarely clean them at all. My tailor (yep!) recommends dry cleaning once a year. Any more apparently damages the weave. I have pants dry-cleaned in a batch once a year and I never clean the jacket or vest unless there’s been some kind of disaster. Shirts are a different thing of course, and I wash them (either by hand or in our building’s laundry) in a fortnightly batch. Thanks for replying to AJ’s budget question. What about health insurance? In Britain, we don’t have Health Insurance as such. Working people pay ‘National Insurance’, which automatically comes out of our wages like a tax. The system is socialist so you get good health care whether you work or not. This ‘expense’ is dealt with before we start making budgets with our net wage. This year, of course, I’m living in Montreal, which uses Medicare. I do not qualify for Medicare, however, so I paid for a single year’s worth of worldwide travel insurance up front. If this became an annual event, I’d have to budget for it of course. i like the idea of Geo-Arbitrage- living in the States this is not the easiest thing to do. Unless you move to a state with lower taxes or not state taxes at all and sell your goods in other states that have higher tax rates and make some additional margins. I found having two lots of extended time periods off work Used it for travel and study. Good to have the time even if not sustainable for the long term. It’s a strategy worth thinking about. Good to check HR policies and suggest options to your boss. It worked for me! Wow, this post really blew my mind. The thought that you could really “retire” in your 20s is great! I like the idea of general frugality and minimalism (I love the library!) but I’m not sure how good I would be at actually implementing them. I think I like my closet full of clothes too much to resort to two outfits only. I’m all for Geo-arbitrage. I don’t know that I’d relocate to Canada (a little too cold for me thanks) but Brazil has a pretty good exchange rate, friendly people a job market, and sunshine and beaches 365 days a year. My dream come true! Thanks for the inciteful information! Thank you for sharing your story. I think it is so awesome and encouraging to hear of others succeeding in ERE. I know that most of us on these boards, myself included are wannabes as of yet. I like reading about all the different stages people are in of the plans they have set out to accomplish because it is just useful food for thought. The kewlest thing about this site is that it is full of original thinkers who also know how to incorporate and share other ideas they have come across. It is the best of both worlds that way. Calgary has many free and fun things to do. Perhaps you should relocate within the city to better take advantage of its awesomeness within walking distance.